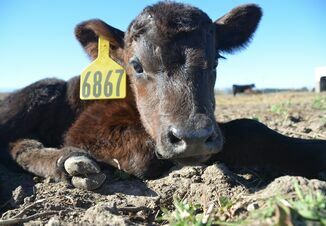 Time is important because a newborn calf’s digestive tract allows antibodies to pass directly into the blood. After 24 hours, the calf’s intestines cannot absorb antibodies intact. The absorbed antibodies protect against systemic invasion by pathogens while antibodies that are not absorbed play an important role in protection against intestinal disease. Allowing the calf to suckle the dam is the most efficient method of feeding colostrum. However, sometimes this is not possible due to problems with the dam or calf. 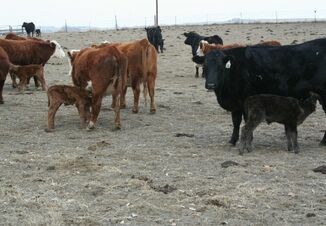 In cases such as these the calf will need to be fed colostrum. Acquire colostrum by milking the dam as soon as possible after calving or using colostrum that you have previously acquired. Acquired colostrum should be from healthy cows to minimize disease transmission. Cows in at least their third lactation generally provide higher-quality colostrum than heifers. A yellow color and a thick, creamy consistency are good indications of quality. Colostrum can be stored by freezing in milk cartons or plastic containers. The containers can be easily thawed and mixed with warm water for feeding. Studies have shown rapid defrosting using boiling temperatures destroys a portion of the antibodies. A warm water bath will ensure that antibodies are intact. You may also want to consider purchasing a commercially available colostrum supplement or replacer if you don’t have ready access to fresh colostrum. Consult your veterinarian on the use of these supplements or replacers. 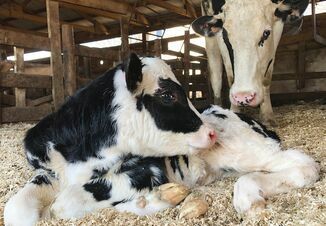 Due to the importance of colostrum to the newborn calf it is always a good idea to have some alternative sources of colostrum on hand “just in case” during the calving season. Here’s a trick for storing colostrum. Use a 1 gallon Ziploc freezer bag. Fill half full (2 qts.) and squeeze the air out before sealing. They lay flat and you have room to store more. When needed, take one out and put in sink of hot water. It thaws and warms up very rapidly and it’s a ready measured feeding. You should date the bag when you store it.